Sinclair College offers more than 250 degree and certificate programs along with technical and specialized areas. In the past four years, more than 15,000 students have received credentials at Sinclair. 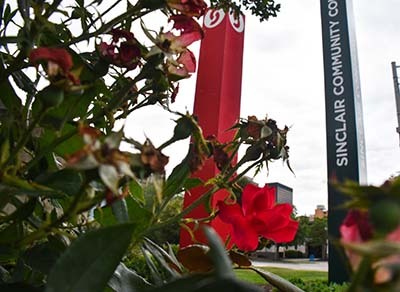 Sinclair has its main branch in downtown Dayton as well as regional centers in Englewood, Huber Heights, Mason, and Wright-Patterson Air Force Base. Sinclair transfer agreements with Wright State in 56 different degree areas and other agreements with every public university in Ohio. Sinclair, established in 1887, fields intercollegiate athletic teams in basketball, volleyball, softball, and other sports. For more information about the college, check sinclair.edu. To increase access and affordability for a college education, Wright State and Sinclair offer the Wright Path partnership program. Go to our community college partnerships overview page to learn all about the benefits of the Wright Path program. Apply to Sinclair and register for classes. To enter the Wright Path program, fill out the participant application and we will verify with Sinclair that you are an active student in good standing. Students must maintain at least a 2.25 cumulative GPA at Sinclair to remain in the Wright Path program. It is important to work with your academic advisor at Sinclair. Let them know you are in the partnership program with Wright Sate, plan to utilize a pathway/articulation agreement, and intend to transfer to Wright State. They will assist you in creating an academic plan that will help you plot your courses for your transfer program. A Wright State advisor will also reach out to you to assist in your transtion. You should meet regularly with your Sinclair and Wright State advisors to ensure you are on the right track. The application fee waiver code for Sinclair transfers is: SCCPartnerSchool. Marquise Crosby, a senior biochemistry and molecular biology major, works as a lab assistant at Wright-Patterson in the Soft Matter Branch of the Air Force Research Laboratory’s Materials and Manufacturing Directorate. Two-time Wright State graduate Tiffani Angus writes fantasy and science fiction stories, while teaching at Anglia Ruskin University.